Spotted right outside my work today, this gorgeous sticker* was stuck to a bus stop sign. And, yes, we do have a Warhol exhibition currently running (highly recommended!). My colleagues reacted with laughter and skepticism. 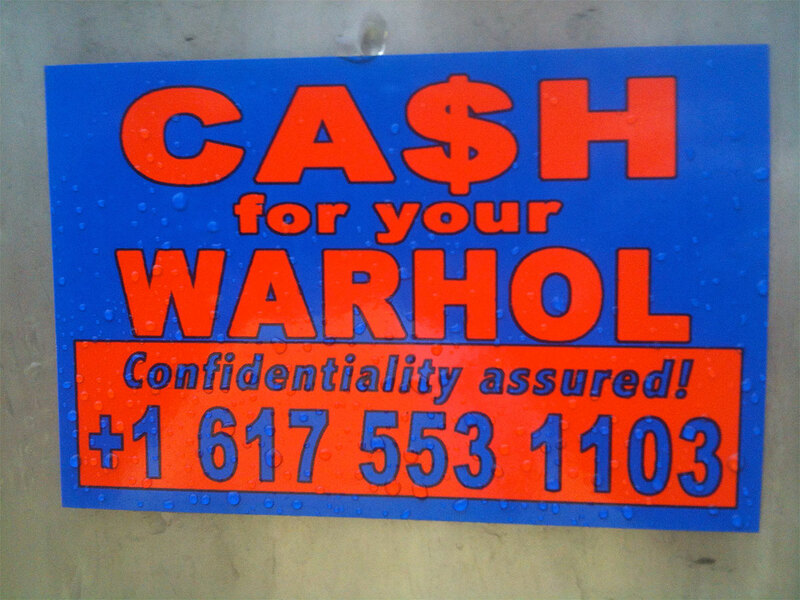 One thing is for sure: if Warhol were still alive and saw this, he would probably appropriate it instantly. *Points off, though, for using Arial rather than Helvetica. Tsk. When will people learn? UPDATE: Ugh, OK, this is some kind of installation art thing. That's a little disappointing. If I had Googled this first, I wouldn't have posted it. Damn,honey, I so want to use that as an LJ icon! Alas, I'm out of spots. I saw one of these near Central Square, Cambridge, and a quick look at flickr seems to show that these signs are in a lot of different places. I wonder who's doing this? Oh, and that's an eastern MA area code. Peteykins, I don't completely understand your disappointment that it's an art installation thing. How could it be otherwise? It's a funny joke. That makes it worth sharing. Thank you. It's definitely a funny joke. I especially like the signs which say "Se Habla Español". I don't know, though... I found an interview with the artist online at Juxtapoz (the official journal of the Macho Shithead art movement), and the artist expressed a fondness for Shepard Fairey (UGH). Good luck getting any Warhol verified at this point. 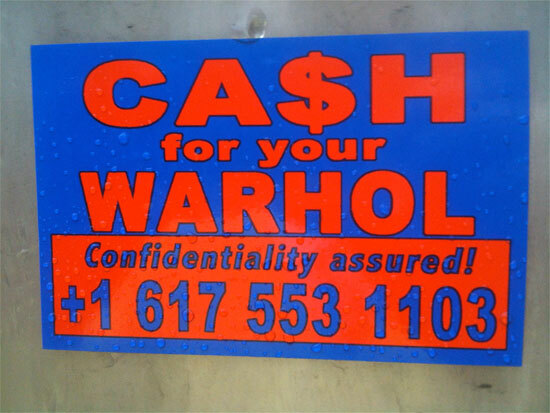 Several of my friends have had their genuine Warhols rejected, and subsequently defaced, by the Warhol Foundation. Don't feel bad Peterykins. I fell for a "We Buy Used Conceptual Art"brochure being given away around the corner from a Charles Gute exhibit. Doesn't Helvetica cost a lot? All your pop art are belong to us!